a continual passing by, as of people, objects, or events: the parade of the seasons. In each person's life, there are seasons of change, seasons of contemplation, seasons of loss, seasons of doubt, and seasons of joy. And if you were able to culminate these seasons and all of their coinciding experiences into something so acute that it could be best expressed in musical form, you would undoubtedly be left with something so eclectic, honest, passionate, thankful, and transparent, that the result would not only be original, but even more so relevant and beneficial to those who were able to experience it. Unless of course all of your life's experiences culminated into nothing more than one of those songs that you wished you had never heard, like, "this is the song that never ends! ", then you would definitely regret this whole 'acute expression' nonsense, for your result would more than likely be of little beneficial value. Luckily, the acute musical gatherings of six young men who call themselves "Goesl's Parade" are so much more than that beloved song that never ends. And with the completion of their debut full length effort, "Wishing Things Different", Heith Guilbert (singer/songwriter and Captain of the ship), Brennan Guilbert (bassist and younger spawn of the Captain), Trip Clark (mathematician and lead guitarist extraordinaire), Ben Youngblood (the narcoleptic synthist), Chris Shumake (the band's 6-stringed musical mortar), and Chris Salih (the only dancing, drumming Arab you'll ever need to know), are striving to present the music industry with something relevant and fresh, all the while staying true to their faith and convictions as believers. Even more unique to this already God-inspired group of hometown friends, is that they took it upon themselves to record their record on their very own by seeking the production and engineering assistance of close friend, Ben Rice, beginning in June of 2006. With six long months of countless hours and endless nights, GP burned many candles, drank many cups of coffee, tried thousands of ideas, and collaborated tirelessly in pursuit of translating their lives into music that they could truly call their own. "Wishing Things Different", therefore, is not just another record in the running for "best worship song of the year", or just another record cranked out to please the all-commercial masses. This record was meant to be very natural, honest, and exciting, with material that would attract a very diverse audience. From recording everything on an old 16-track, to using the organic sounds of a still night on a front porch, or to the making of a road trip to the dust gathered air of a century old chapel deep in the creepy woods of Louisiana for the recording of many of the vocals, this record is simply put, the proud product of 7 close friends concentrating on nothing short of achieving a record best representing the hearts and minds of each of them, their talents, beliefs, doubts, joys, and creativities. And in doing all of this together within the confines of the home of Ben Rice, the vulnerable honesty and raw passion that Goesl's Parade wanted this record to have is truly captured. 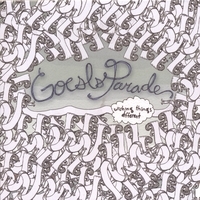 "Wishing Things Different", released in February of 2007, will begin the musical journey ahead of GP as they will begin performing for the record's support. Be sure to follow this talented group of friends as they embark together upon their pursuits in life and music, and into the gathered expressions of both.